Manufacturer of a wide range of products which include distillation plants. 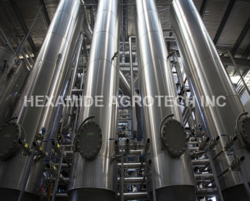 We are backed up with a expert workforce rich industrial experience that assist us in offering a wide range of Multipurpose Solvent Distillation Plants. These are well configured with precocious manufacturing methods, efficaciously. Efficiently operated at reduced energy consumption these provide higher production. Our manufacturing unit make the use of modern techniques and superior quality Steel Plates so as to meet the fixed industry standards. Multi Purpose Solvent Distillation plants are specifically designed to work at atmospheric vacuum.